Any time money is involved, a record must be created. Successful pension applicants expected payment. Records were created to ensure that payment was timely, correct, and made to the right persons. Records also helped guard against theft and fraud. From the nineteenth century to mid-1909, pension payments were made by designated "pension agencies" located in major cities across the United States, and payment records were kept in unwieldy oversize leather-bound volumes. In the late 19th century until 1912, the pensioner had to present himself or herself, along with his or her (1) pension certificate and (2) quarterly pension voucher to a notary public or other officer authorized to administer oaths on or after the 4th day of the designated month. Then the pensioner mailed the notarized voucher to the pension payment agent, who then mailed the pensioner his quarterly pension check. Beginning in February 1913, that system was replaced by centralized payment from Washington, DC. 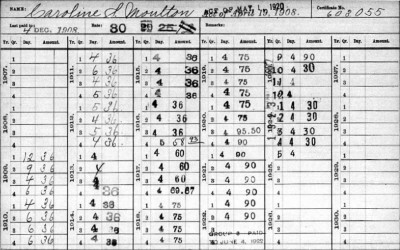 Beginning in 1907, the Bureau of Pensions transitioned from the giant leather volumes to a card-based record keeping system. Payments were recorded on over 1.8 million cards that measured 5 inches by 8 inches. These cards were arranged in alphabetical order by name, except that persons with Native Americans names are found at the beginning of each letter of the alphabet. In the early 1970s, these records were published as National Archives Microfilm Publication M850, Veterans Administration Pension Payment Cards, 1907-1933 (2,539 rolls). M850 includes veterans and widows of the Civil War and all other wars, except those from World War I, whose needs were serviced by different agencies than the Bureau of Pensions. This record series ends in 1933 due to changes in the pension system. The records were transferred to the National Archives sometime between 1941 and 1948. M850 can be freely searched online at FamilySearch.org or Internet Archive. Veterans' cards are titled "Army Invalid" and "Navy Invalid." Both contain similar information. The front side has the veteran's name, military unit, pension certificate number and its most recent date of issuance, disability for which pensioned, pension law under which pensioned, monthly pension rate (amount) and the date that rate began, name of previous pension agency or payment group, date of death, and date the Bureau was notified of death. Since pensions were paid in arrears, not in advance, the veteran's unpaid accrued pension moneys could be paid to his widow after his death. Thus the card may indicate the widow, her address, and the date that the veteran's accrued pension was ordered to be paid to her. Dates upon which the pension rate was increased may also be noted. Sometimes, the name of the pensioner's lawyer is given along with the amount of the fee paid to the lawyer through the Bureau. The reverse side has the veteran's name, certificate number, and the rate and record of individual quarterly payments. It includes the "day" the voucher was notarized (or received) by the pension payment agents for payments made through 1912. 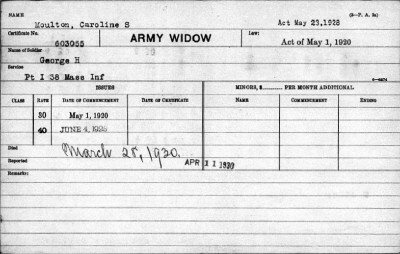 "Army Widow" and "Navy Widow" cards contain information similar to that found on veterans' cards, except that the veteran's name is given instead of disability. There is space for recording names of minor children, and the beginning and ending dates for their $2 per month benefit. Pension payments for minors typically ended on the 16th birthday. Starting in January 1923, payments were made monthly instead of quarterly, so new cards were added to the file that had adequate space to record monthly payments. Thus, some pensioners have two cards. In few instances, a communication about the pensioner may be included in the records. 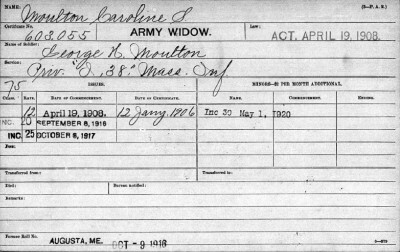 Caroline S. Moulton has two cards that identify her as the widow of George H. Moulton, 38th Massachusetts Infantry. Her widow's pension certificate 603,055 was granted January 12, 1906. Beginning April 19, 1908, she received $12 per month pursuant to the Act of Congress of April 19, 1908. Her monthly pension rate increased to $20 on September 8, 1916, then to $25 on October 6, 1917, and finally to $30 on May 1, 1920. Pension moneys she received through the fourth quarter of 1908 were recorded in the oversized leather volumes mentioned above; payments for 1909 and later years were noted on the card records. Based on those monthly rates, the two cards detail the $36, $60, $75, or $90 quarterly payments she received as her monthly rate rose. She and other "Group 3" pensioners were transitioned to monthly payments by October 1922, and received $30 monthly thereafter. She died March 28, 1930, and the Bureau received notification on April 11, 1930. Due to her death, the last payment (April 1930) is marked "check canceled." [M850, Roll 1,621, cards for Caroline S. Moulton]. 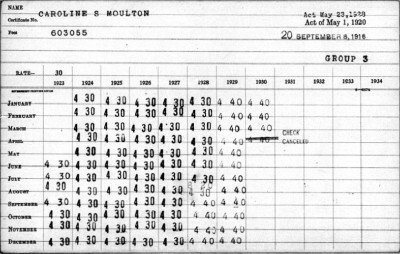 Pension payment cards for 1907-1933 summarize the financial benefits pensioners received from the federal government by providing detailed information "at a glance" about payments made to pensioners, widows, and minors.